I'm currently bed bound in a London hospital intrigued by a portrait of Richard lll. Out hunting at Woodstock with King John and his retinue. I can't take my eyes off his gorgeous queen. Isabelle has chosen to wear thigh-high boots, black tights, a short tunic and a feathered hat. Sanctus Deus! Ehrlitan, in the house of a Tanu Spiritwalker who's just warned me to cross the Raraku desert because of the Whirlwind. But being a stubborn Bridgeburner, I'll do it anyway. Since I'm always reading more than one book, I'm also laying siege to Mont Ségur. 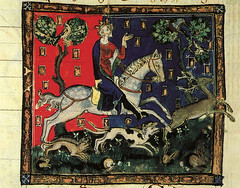 [quote=""annis""]Out hunting at Woodstock with King John and his retinue. I can't take my eyes off his gorgeous queen. Isabelle has chosen to wear thigh-high boots, black tights, a short tunic and a feathered hat. Sanctus Deus! Oh my stars - what ARE you reading Annis? Must be some Urban Fantasy version of Isabelle. Lol! It's James Goldman's "Myself As Witness", a novel about King John as written by Giraldus Cambrensis (Gerald of Wales). It's quite entertaining, but though it's meant to be about KJ , slyly witty Gerald steals the show It was written in 1979, so there is the odd error due to information not being available at that stage- for example, Goldman makes William Longspee's mother Rosamund Clifford instead of, as we now know thanks to EC, Ida de Tosney. I'm dead. And I'm telling everyone that I killed myself because its their fault and not mine own. I'm somewhere on the coast of England, in the future I think. I'm in a children' psychiatric hospital treating a girl who murdered her mother, who seems to be able to predict the future too.